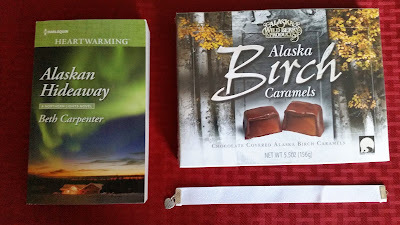 This month's prize is a paperback copy of ALASKAN HIDEAWAY, a ribbon bookmark with a heart charm, and a box of yummy birch caramels from Alaska Wild Berry Co.
You must be subscribed to the Beth Carpenter newsletter to win. If you're not already subscribed, you can sign up HERE. 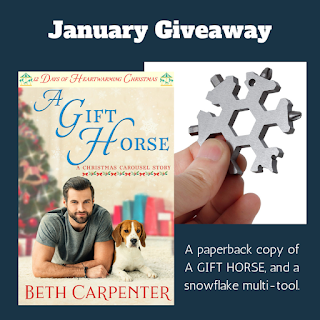 International entries are welcome, but if the winner doesn't have a US mailing address, the alternate prize will be two Harlequin Heartwarming e-books. Must be 18 or older to enter, no purchase necessary. If winner does not claim the prize within a week of notification, a new winner will be selected. Giveaway ends May 1st. This month I've giving away THE ALASKAN CATCH, the first book in the Northern Lights series, along with THE CHARM OFFENSIVE by Cary Lynn Webb, and a pair of colorful moose socks to keep your feet happy while you read. International entries are welcome, but if the winner doesn't have a US mailing address, the alternate prize will be two Harlequin Heartwarming e-books. Must be 18 or older to enter, no purchase necessary. If winner does not claim the prize within a week of notification, a new winner will be selected. Giveaway ends March 26th. Since Leith in AN ALASKAN PROPOSAL is a survival instructor, I'm giving away this snowflake-shaped muli-tool to help you survive loose screws and sealed bottles. Plus a copy of A GIFT HORSE, to entertain you while you survive. Must be 18 or older. Overseas entries welcome, but if winner has no US mailing address, the prize will be 2 ebooks. If winner hasn't responded within a week of notification, a new winner will be selected. Thanks for all your fun giveaways! You're very welcome, Susie. I have fun looking for interesting things to give away. Awesome authors! Awesome Books! Thanks!! Aw, thank you and you're welcome. I see the leaves changing colors as this is the peak of autumn. The air is crisp and the leaves are golden, crimson and crunchy underfoot. I love autumn, even though the colors here are mostly golds and and yellows. Someday I want to go east and see the true autumn colors of a hardwood forest. I like the carousal ornament. Thank you for the chance. 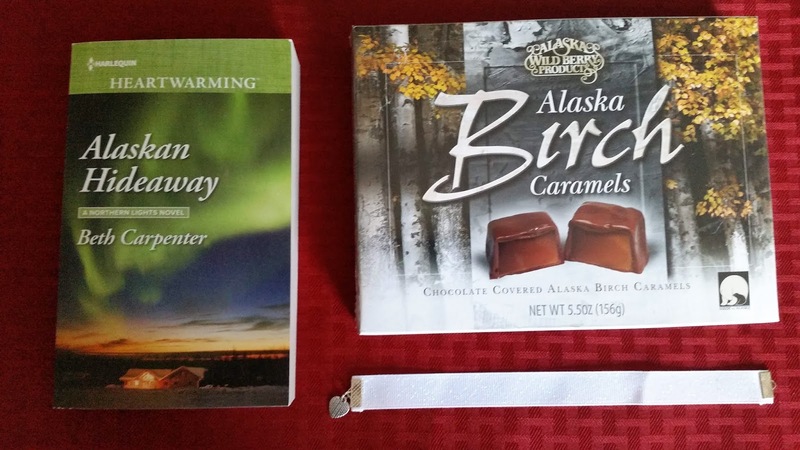 THANK YOU BETH FOR YOUR AWESOME GIVEAWAYS LOVE YOUR BOOKS! Aw, thank you, Sarah! You're very welcome. These books look amazing, Thanks for this terrific chance at these goodies. Great socks, and books of course (! ), and I will do the steps (that weren't already done, of course) asap. :) Thanks for the great reads and giveaways! THANK YOU BETH FOR THIS AWESOME GIVEAWAY LOVE YOUR BOOKS! Thanks for the chance to win. 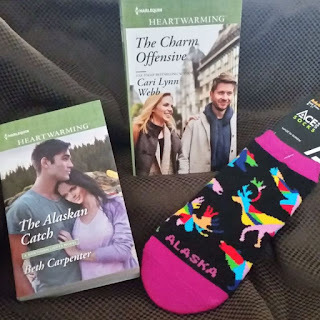 Love books about Alaska!